» About Us Ride South L.A.
Our bicycling map to the Watts Towers was our first, followed by the Healthy Food Map for South L.A. Our aim is to build community and advance social justice in South L.A.
To stay grounded in our community, our maps are developed and tested in workshops with community organizers, researchers and neighborhood residents. We use ParTour — an approach and technology for using basic cell phones to help situate civic engagement in physical streets and in local communities. In brief, our our partners include a diverse group of organizations around the city with a focus on bicycle and social change advocacy, including T.R.U.S.T. South LA, the East Side Riders Bike Club, CSU, C.I.C.L.E., Bikerowave and CicLAvia. The Research & Development for this project was largely done by USC’s Mobile Lab within the Annenberg Innovation Lab, and the Metamorphosis Project/MetaConnects. More on our partners is below. Still have a question? Leave a suggestion/photo, or contact us. The Mobile Urban Mapping Project within the USC Annenberg School for Communication and Journalism is a joint effort of two research groups, and is responsible for our ParTour methodology for crowd-sourced mapping and engagement. Our parent research groups include the Metamorphosis Project led by Prof. Sandra Ball-Rokeach, and the Mobile Lab led by Prof. Francois Bar. The ParTour project is supported in part by the Annenberg Innovation Lab. For more on the theory behind this work, see our description of situated engagement, or the recently-launched MetaConnects, which is a translation of Metamorphosis methods into everyday use for community organizations. T.R.U.S.T. South LA, which was established in 2005 as a permanent and democratic steward of land in South Los Angeles that works toward community- focused development. Recently they have partnered with CicLAvia and a number of community stakeholders to bring CicLAvia to South LA and work toward the expansion of the route into the heart of South LA. 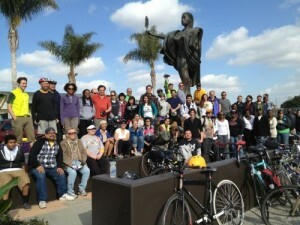 Read more about their CicLAvia effort. Special thanks go to East Side Riders (ESR), which have been part of the effort to include Watts in the CicLAvia route; to CicLAvia which is bringing a whole new energy to our streets, and to VozMob, which is the origin of the mobile technology we’re using to gather pictures and stories (and especially to the VozMob contributors who contributed enormous amounts of time to make this platform a reality, from the amazing PCT worker volunteers, to IDEPSCA staff and USC students). Thanks to everyone who has contributed, but particularly to our riders who have been crucial in creating our maps!